You probably already know that watching television is the world’s most popular leisure activity. In the 1970s it was uncommon for kids to watch TV before the age of four, now it’s uncommon for kids not to be watching TV when they’re four months old. In the developed world, 99% of houses have a television and 66% of homes have three or more sets. TV has been proven to increase cravings for junk food, and increase the likelihood of becoming overweight, being bullied, underperforming at school, being inactive, and becoming prone to misbehaviour. Every hour you spend in front of a TV takes 22 minutes off your life; that means you’ll die five years earlier if you watch six hours of television a day. We know too much TV is bad for us, but have you ever stopped to consider the effect that television might be having on your spiritual growth? Here are 12 things to think about the next time you sit down to your favourite sitcom, movie or news show. The average person will spend 9.1 years of their life watching television (that includes 2 years of mind numbing commercials!). If you have a spouse and watch TV, you probably spend 3 to 4 times more time in front of the television than you do talking to your partner. That number is set to increase with the introduction of online and time-shifted viewing, letting us watch what we want when we want it. Television on demand has given rise to a new craze known as “binge watching” where people lock themselves in a room and watch television seasons or movies back-to-back, barely surfacing for days or weeks. Some people believe it takes 10,000 hours to become an expert at anything. 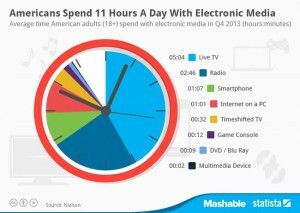 There are almost 80,000 hours spent in front of the tube in nine years of television viewing. Just think how many meditation techniques someone could master, or how good their awareness of the present moment would become if they devoted even two thirds of this time to their inner development. If you feel like you don’t really watch that much TV, use this handy tool for an objective analysis – the results might surprise you! With so much time spent in front of the screen you’d think we must enjoy everything we’re watching, but it’s not always the case. When was the last time you stayed in front of the TV, even when there was nothing worth watching, just because you couldn’t summon the energy to drag yourself away? We are addicted, but it’s not entirely our fault – network programmers want it that way. News, particularly daily news, is more addictive than crack cocaine, more addictive than heroin, more addictive than cigarettes. Researcher Herbert Krugman discovered that endorphins were released while watching TV, a kind of naturally produced opiate. 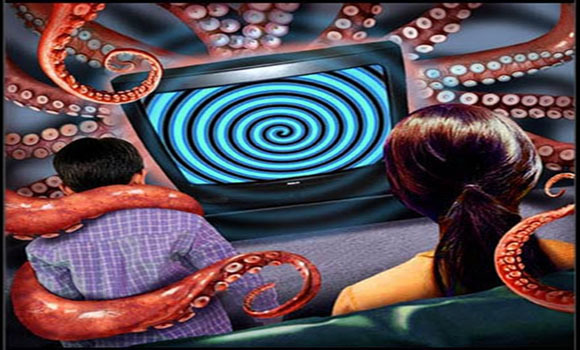 TV programming is never-ending, and TV networks use psychological tricks to addict us which are hard to see and harder to break free of as they play on our instinctual drives. Television stimulates desire and curiosity by constantly showing us promos for upcoming shows and leaving episodes in cliffhanger scenarios, creating a knowledge gap that acts like a mental itch that we can’t help but scratch by tuning into the next show. Addictions of any kind are harmful spiritually as they chain us to something external and make us psychologically dependant upon it. When those addictions also steal our time there is much we lose out on. #3 Concentration – a dying ability? We are trained from birth not to concentrate on what we’re doing – a trait reinforced through years of living in a hyper connected society and multitasking. Researchers have found that there is a close link between attentional disorders and time spent in front of the TV. Television shows are increasingly so fast paced (seriously, watch that video and your head will spin) that regular life is unexciting in comparison and we can easily have trouble paying attention to the slower pace of everyday existence, which lacks explosions and rapid scene changes to keep us amused. We improve in whatever we do repeatedly, so it’s unsurprising that if we spend a lot of time zoning out in front of the TV then we can find it hard to focus our minds on anything. That’s bad news if you’re interested in meditation, astral projection or awareness of the present moment – all activities that require a focused mind. 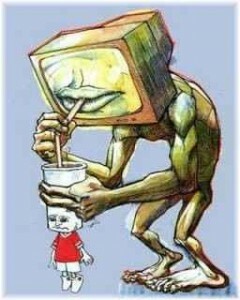 The next time you turn on the television, try to notice what you’re doing while you watch it. Are you focusing on what you’re watching? Or are you eating dinner, checking your emails, playing a game on your phone or any number of other things that split and strain our attention? Spiritual development wakes us up to what’s really going on in the world by developing an awareness of the present moment and an ability to see through illusion. By doing so we discover who we really are and learn about reality. More and more, however, television is becoming a filter through which all our human experiences are validated and even lived – “life” can be experienced vicariously through the characters in our favourite movies or TV shows. This vicarious experience threatens to numb us to events in the real world, and we are pressured to maintain the status quo of consumerism and animalistic behaviour promoted by advertisers and network programming. Practically everything we see on television is scripted and fake – even so-called “reality TV” shows – but it’s easy to feel inadequate in comparison to the high-flying personas that make for entertaining viewing. Feeling insufficient we are more prone to daydreaming about how we wish our lives were, even going so far as to create imaginary relationships with our favourite characters. TV urges us to escape from our lives rather than see and understand our lives for what they are, and use the real-life circumstances we have each day to awaken consciousness and develop spiritually. Watching lots of television can cause us to live our lives in a dream world, but the act of watching itself can put us into a trance-like state. Jerry Mander, author of Four Arguments for the Elimination of Television, explains how the brainwaves of viewers’ slow down while watching TV, regardless of what they’re watching. Researchers have discovered that we become mesmerised by the technical aspects of television editing including cuts, edits, pans, zooms and sudden noises, which trigger involuntary responses and keep our attention glued to the screen. We can see a close relationship between the speech patterns of news presenters and those of hypnotists, as both speak in an even monotone voice while looking directly into the eyes of the subject. 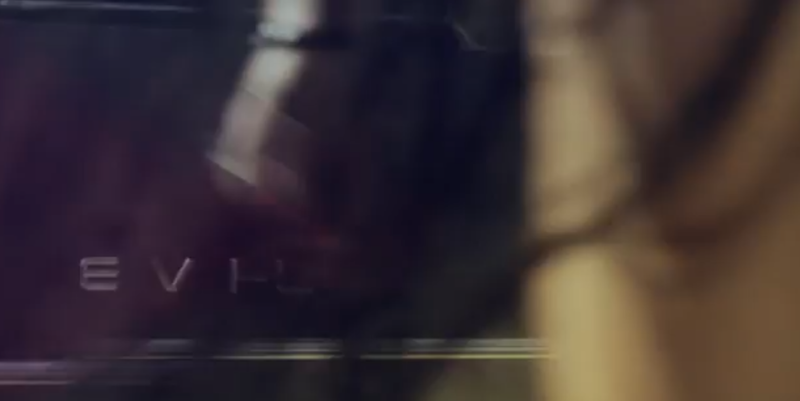 News shows in particular are also known to employ other hypnotic techniques such as the use of mnemonic imagery and numerical countdowns before relaying the so-called “news”. If you have ever noticed yourself become completely absorbed in the TV, unaware of what’s around you, you know what I’m talking about. In this state, the left side of our brain used for analysis and critical thinking is switched off in favour of our more emotional right brain. 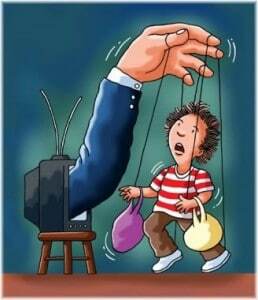 What we see on TV is delivered directly into our subconscious mind where it influences our beliefs about the world. If these beliefs implanted in the subconscious are not consciously uncovered, they are often acted upon rather than moderated. TV’s trance-like effects on our brains can linger – even when we switch off the television our brains can remain in a state of lowered alertness. Do we really want people we don’t know implanting behaviours and beliefs deep within our minds? Television is commonly considered one of the most effective tools to pacify and subdue psyche ward patients and prison inmates around the world. And if you’ve ever heard the phrase ‘veg out’ in front of the TV that’s exactly what we’re doing –while watching TV our brains have less activity than when we are asleep. 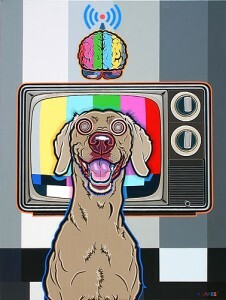 Researchers Kubey and Csikszentmihalyi found that for many people television elicits a conditioned relaxation response. The sense of relaxation ends when the set is turned off, but the feelings of passivity and lowered alertness continue. Survey participants commonly reflect that television has somehow absorbed or sucked out their energy, leaving them depleted. Regular TV viewers can have their world view essentially mediated for them by television networks. The job of the audience is to passively accept and absorb the point of view TV presents. This results in a public with similar conditioning who in real life are more likely to accept the world view presented to them by others. This begs the question – are our thoughts our own? And if not, who’s are they? Shortly, the public will be unable to reason or think for themselves. They’ll only be able to parrot the information they’ve been given on the previous night’s news. To live spiritually in the moment we need to be active, to see for ourselves how we and the world really are. If you’ve ever tried to observe your thoughts and emotions you would have noticed that depression, anxiety, and other negative states come and go without any effort on our behalf, draining our energy as they go. While watching TV this process happens on autopilot. The more time we spend passively absorbing entertainment rather than actively engaging in life, the more we train ourselves to watch rather than partake in our existence. Without activity, our consciousness is less likely to manifest and the more difficult awakening becomes. As well as making us passive, television alters our brain function, reducing activity in the neo-cortex and other higher brain regions and increasing activity in lower brain regions known as the ‘reptilian brain‘ and the limbic system. These lower parts of our brains are used to moderate negative emotions and instinctual behaviours related to aggression, dominance, fighting over territory and procreation. The next time you’re watching advertisements or music videos – two types of media which particularly appeal to our animalistic drives – you might find it interesting to try to understand what drives or emotions the programmers are trying to evoke in you. By viewing critically we are more able to separate ourselves from this influence. Overtime we can replace the animalistic parts of ourselves with greater consciousness which benefits our spiritual experience. 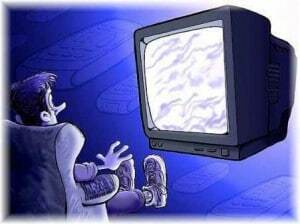 Researchers have found that the happiest people do not watch television. Most advertising is based on making people feel self-conscious, insecure and inadequate. 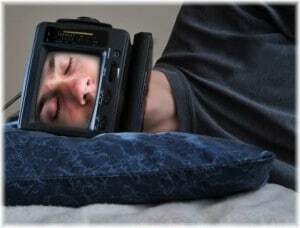 If we just buy this latest gadget, we’ll finally be happy! But it’s not physically possibly to compete with the fake reality shown in movies and TV shows and comparing our lives to the people we see on screen can leave us feeling depressed and dissatisfied with our existence. While this might have the effect of causing us to search for a deeper purpose to life, the common response to negative emotions is to hide them by searching out more intense entertainments and distractions – which TV networks readily supply, perpetuating the cycle of TV dependence. TV’s influence on our emotions doesn’t stop there. Watching scary or violent movies can cause us to relive traumatic memories from the past. Viewing of violent or grotesque imagery creates chemical changes in our brain similar to those seen in post-traumatic stress, and if we see enough repeated acts of violence, our body reacts as if we are the ones being abused. Researchers have discovered that when we watch negative news broadcasts, not only are our lower emotions such as sadness, anxiety and depression stimulated, but unrelated worries in general become heightened. Test subjects were found to be more likely to catastrophise their concerns, blowing any worries they already had out of proportion. TV creates a wide ranging emotional impact that we live with long after we have turned it off. Television programmers are experts in emotional manipulation and when they can control people’s emotions they can turn them against you and anyone they see fit. Spiritual minorities are a common target for demonisation. TV programming can cause people to become afraid and distrustful of anything not supported by the televised norm, and without awareness of this mechanism of fear people can readily give up their freedoms for an illusion of security. Emotional intelligence is the ability to understand your own and others emotions and to use an understanding of emotions to guide your behaviour. Unfortunately, television is dulling our awareness of our feelings and creating a generation of people grossly lacking in emotional intelligence. A recent study by the Millennium Cohortfound that kids who watch more than 3 hours of TV a day had a higher chance of emotional symptoms and problems in relationships. Psychologically it’s well known that children who watch more TV are less likely to display empathy, will resort to aggression or sadistic behaviour, will be argumentative and will seek instant gratification. Others have found that children who watch too much TV lose the ability to read social cues, and that increased TV viewing leads children to have a poor understanding of other people’s emotional states, and to be unable to distinguish the thoughts and feelings of others from those of their own. Are we creating a generation of people who will be unable to develop spiritually because they are unable to understand their own emotions? TV propagandists and advertisers more than anyone would benefit from the creation of a public with an inability to determine their own thoughts from those of others. And it’s a vicious cycle. It’s been proven that kids who watch entertainment TV are less likely to read books, so those who watch lots of TV often end up getting all their information about the world from just one source. It’s fairly well-known that only a handful of corporations own almost all of the media outletsthat we tune into. But do we stop to consider that those behind the networks and their advertisers with billion dollar budgets all have an agenda to push? Through shows, movies, and the news we are repeatedly told how to act, what to think, and which products or entertainment we need to consume. A Harvard University researcher concluded that for every extra hour of television someone watches per week they spend an extra $200 a year. It’s not uncommon for people to go into debt chasing the dream lifestyles portrayed on television. We then have to work more to pay our bills, come home exhausted and lacking free time and energy crash out in front of the TV, perpetuating the cycle and losing valuable time that could be used more effectively. Beyond simple physical guidelines it seems we are also being given a guideline to our spiritual life (or an imposed lack thereof). Some of this programming is fairly out in the open. Take this Versace commercial for instance which seems to be all about conformity and having our lives and desires dictated by powerful people in society. Or the 2014 grammy awards which seem to display a barely disguised black magic ritual. Other programming is more subliminal. Take these images from kids shows for example, orthis screenshot from Ke$ha’s Die Young Video, where the door of her car says ‘Evil’. Have you ever found yourself quoting lines from your favourite TV show? Do you walk or dress like your favourite character? Are your political and spiritual opinions your own or are you just repeating what you saw on the latest political debate or morning variety show? What would your life be like if you’d never watched TV? As a species we model or mimic behaviours of those in positions of authority, and we are definitely set up to feel that the people on TV have more authority than us. Unsurprisingly as TV becomes more violent and shows more acts of sexual promiscuity, these behaviours are increasingly prevalent in society. By the time the average person reaches the age of 18 they seen over 200,000 violent acts on TV including 40,000 murders and more than 50% of students in Grades 7 to 10 have witnessed their peers imitating violent acts they’ve seen on TV. Even the Disney Channel is not immune as one Mother discovered when her daughter began acting arrogantly and hurtfully towards her friends after too much exposure to Disney programming. Our morals and behaviours are influenced through the emotively driven storylines of television shows and movies and we can begin to unquestioningly accept the reality that they present about how people should behave in the world. As we do so true spiritual values like empathy, compassion, inner peace and patience are increasingly becoming lost to the world and are seen as bizarre, replaced by acts of indulgence, violence and consumerism. Anything we do repetitively during the day will re-occur at night in our dreams. That includes thoughts, emotions and behaviours. That’s why you might find yourself working in your office in your dreams every night, or living out the scenarios you’re most anxious about. Movies and TV shows hijack and accelerate this process, embedding images directly into your subconscious which then can come back as dreams. If you’ve been watching a lot of horror movies and keep having strongly emotional nightmares about being attacked, chased or killed this might be why (it can also be due to the state of your psyche). For as long as people have been sleeping, dreams have been amazing source of spiritual and divine guidance, a way for people to tap into the mystical side of life and get access to teachings from beyond the physical realm. In order for this to happen dreams need to be as clear as possible – a process helped by being as clear and free of emotion as we can be during the day. Watching too much or the wrong type of television can hinder this process as the heavy imagery embedded in our subconscious takes the place of other more meaningful experiences. Think for yourself, especially when it comes to spirituality! Television is not all bad. Choosing and critically watching the right movies or shows can inspire us, inform us, teach us new skills or give us spiritual strength. But be mindful of what you are putting into your subconscious, and try and uncover the emotional and behavioural effects your TV viewing – particularly the violent or animalistic programming – has on your spiritual development. Next time you get the urge to watch TV, you could sit down and do a meditation practice instead. Or go for a walk in nature and try to be aware. You might get cravings and withdrawal symptoms, but if you stay strong these withdrawal symptoms will be shortlived and your life will be so much better. Have a really good practice and you’ll wonder why you ever watched TV in the first place. 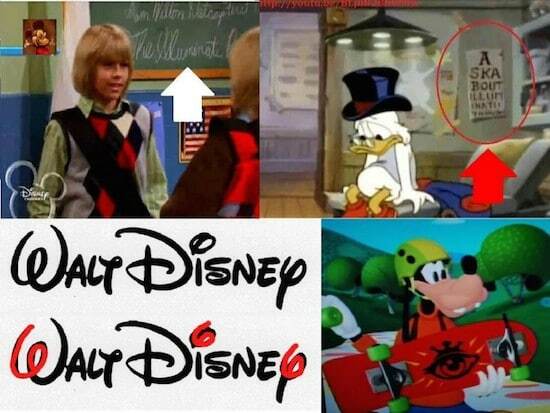 Remember that almost everything on TV is scripted. Even the news is a form of entertainment. It’s not your life, and it’s not reality. I wanted to leave you with part of a speech from the 1976 movie Network. We deal in illusions, man. None of it is true! But you people sit there day after day, night after night, all ages, colors, creeds. We’re all you know. You’re beginning to believe the illusions we’re spinning here. You’re beginning to think that the tube is reality and that your own lives are unreal. You do whatever the tube tells you. You dress like the tube, you eat like the tube, you raise your children like the tube. You even think like the tube. This is mass madness. You maniacs. In God’s name, you people are the real thing. We are the illusion. 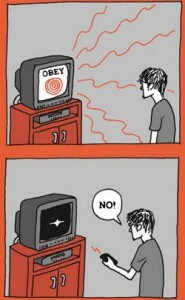 So turn off your television sets. Turn them off now. Turn them off right now. Turn them off and leave them off. Turn them off right in the middle of this sentence I am speaking to you now. Turn them off! One thing is certain. Any real spiritual revolution will not be televised.